Last November 2010, we birded in Mt. Polis from near the border of Mt. Province and Ifugao. Together with birding buddies Rey Sta. Ana and Ralf Nabong, we were guided by the best bird guide in the country, Nicky Icarangal of Birding Adventures Philippines http://www.birdingphilippines.com), for three days! If not for Nicky, we could not have framed those montane birds of Mt. Polis. Let me share a picture of a bird I mistakenly identified as an Olive-backed Sunbird. Thinking that it was just an ordinary sunbird, I just took some shots. I later on showed the picture to the group as a proof that there's a sunbird around when I heard them discussing that there were no birds around in Banaue Ethnic Village and Pine Forest Resort where we stayed for a while after birding in Mt. Polis. Nicky howled it was not a sunbird and everybody gave me stares like I have kept the bird to myself without informing them. So up we went to the rooftop to have another look, but unfortunately the bird was no longer there. Fortunately, with the few shots I made, I was able to keep these pictures of what has been correctly identified as a Mountain Leaf-Warbler. There is another warbler in Mt. Polis that almost knocked us out of frustration. We call it Mr. Bush. It is so skittish and it is so difficult to catch in frame. Mr. Bush readily answers bird calls and he really comes near, almost just one or a couple of meters away, but it is still very hard to photograph. For so many times, we called him... for so many times he answered back and went near us, but we continuously failed to nail him. Rey said that Mr. Bush is either a very good bird target for sure one can sharpen his stalking and shooting skills, but it can also knock out a bird photographer who might suddenly give up because Mr. Bush is hard to frame. After some tries, we just ignored him, even if he himself was making the calls and was very near. Luckily I got some good frames of Mr. Bush whose name is really Luzon Bush-Warbler. There are three more bird stars in Mt. 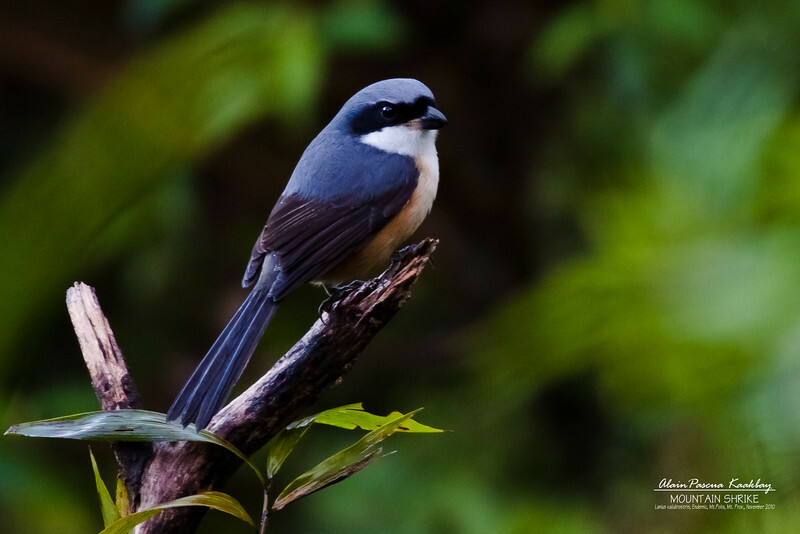 Polis: Luzon Water-Redstart (endemic, usually found above 300m above sea level), Mountain Shrike (endemic, usually found above 1000m), and Mountain Tailorbird (usually found above 800m). These are our treasures and are often the target birds of foreign birders who visit the country just to watch our wild birds, particularly our endemic birds. This kind of tourism is now being called AVITOURISM.